Our clients come to Sunlight Sewing, Inc. for the pride and quality represented by the "Made in the USA" label. Personal attention and responsiveness of working hands-on with a US-based facility. 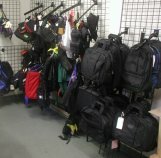 Sunlight Sewing, Inc. is a full-service sewing contractor and manufacturer capable of a variety of light and industrial sewing techniques. We are available to assist in the design refinement of your product, locating materials and the final production process. Below is a few sample products we currently manufacture for world leaders in their respected fields.